The Pop aims to bring "dramatic styling to the city car segment." Kia has unveiled a concept for a three-seat electric city car that will debut at the Paris auto show next month. Called the Pop, the zero-emissions car is just 3000mm long, the same length as the four-seat Toyota iQ minicar and 300mm longer than the two-seat Smart ForTwo. Kia said the Pop aims to bring "innovative design chic and dramatic styling to the city car segment." The Pop has seating for two adults in the front and a single seat in the rear behind the front passenger. 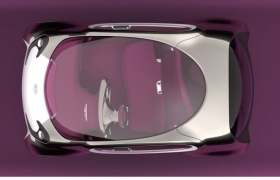 The Pop has a three-seat layout. Kia said it will release more details of the car at its launch in Paris on Sept. 30.